There is a yet another political hiatus over the Greek economy which is yet again said to be on the brink. Scaremongers are warning that ATMs in Greece will run out of cash and travellers will be stranded … cashless. Angela Merkel and Francois Hollande are playing hardball pounding the table Khrushchev style (without the shoe) and wielding the handbag Thatcher style. Antonis Samaras holds what he thinks is a trump card that yet another election if Greece isn’t given more time to comply with the austerity programme holds the threat that the Euro-exit axis will gain power and trigger a domino effect resulting in the Euro’s demise. Me? I’m on the brink of going back to Greece to convert my hard-earned Sterling into Euros in support of the Greek economy … and to have a great time. Two days of hard work have just about got the garden in shape to leave. Potatoes harvested and damaged specimens made into mash and in the freezer, courgettes harvested and made into ratatouille for the freezer. All hedges trimmed. Lawn mowed. Pelargoniums beheaded. I decided that I didn’t fancy tackling the M5/M6 crawl after that so decided to meet up with friends in Cardiff on Thursday evening and leave early Friday morning to travel Up North for a night out in the Greek Restaurant in Didsbury. Flight to Kos on Saturday, ferry to Nisyros on Sunday. Bags now packed. This time I’m going back to islands which I know and am planning on lots of walking, going off the trodden paths and searching out new places and landscapes. 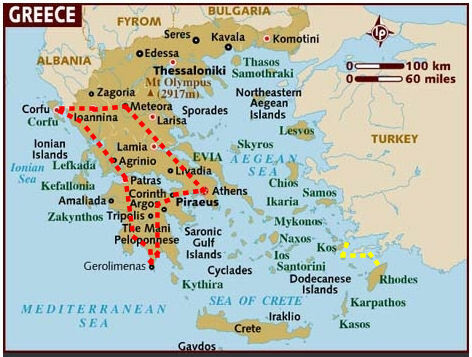 As a comparison, the map shows the route I followed on the 2012 Greek Odyssey Part 1 (in red) and the what I intend to cover in Part 2 (in yellow). A lot more walking. A lot more detail. This entry was posted in Greece and tagged Greece, Greek economy, Nisyros, Symi. Bookmark the permalink. Kalo Taxidi! Have a great time. Looking forward to hearing all about your adventures via the blog.